Have your say: three more council consultations! Read the details and respond by 18 December. Here are our comments. 3. Knatchbull Road/ Lilford Road/ Minet Road Junction – it will provide Bikeability instructors at Loughborough Primary School on Minet Road with a headache. A conventional alternative option would be a mini roundabout, but will this leave Lilford Road dominant in reality? Giving priority to traffic on Knatchbull and Minet Road crossing Lilford Road runs the risk of increasing rat-running on the these roads, plus drivers on Lilford Road may not respect the priority. What are your priorities for your streets, open spaces and places? Lambeth council's consultation. Following the recent engagement done around the Our Streets programme, the council's gone to the drawing board to come up with proposals that cover the points raised by residents and businesses in the Thornton, St Leonards, Streatham Wells and Streatham South wards. Don't speed past this consultation, act now to have your say on changes in different bits of Clapham and Streatham. You can respond now on Lambeth Council's website. These comments may help you. A more structured approach to managing the road network programme, such that many roads become access only would be more effective than the majority of the measures outlined here. In principle therefore, we oppose most of these measures. In the absence of sufficient political will from Lambeth to commit to such a scheme, we make these suggestions on the measures proposed. Rat runs at Glenister Park Road, Sherwood Road and Woodmansterne need to be controlled so only residents can reach their homes, or reduce the lanes so that HGVs do not use this route as a short cut in order to avoid Greyhound Lane and A23. Possible closure at bridge on Glencairn Road. To improve the weaker measures proposed: The existing flare at the junction with Glenister Park Road makes the pedestrian crossing on the road unacceptably long, so the junction geometry needs tightening. This may be drawn on the plan, but the width can probably be further reduced. Consideration could be given to changing the priority at the junction with Hawkhurst Road, as a means of reducing speed along Sherwood Ave.
Cycling with pedestrian priority should be permitted on the path between Sherwood Ave and Runnymede Crescent. The opportunity may exist within this scheme to make the kerb flush. The volume and type of traffic here is likely to mean that, to score well on the Cycling Level of Service, separate space for cycling is required. The proposals do not address this. Given the proximity of schools and the east-west desirability of the Mount Nod Road/Leigham Avenue cycle route, the priority should be changed so that users of Leigham Court Road give way at this junction. A pedestrian/cycle zebra would be a second, but poorer option as would a Toucan crossing. Provide an adult and child friendly north-south route parallel to the A23 by filtering out through-motor traffic. Make Valley Road and Leigham Vale a quiet and green cycleway, using modal filtering to minimise motor traffic on these roads and preventing their use as a rat-run. 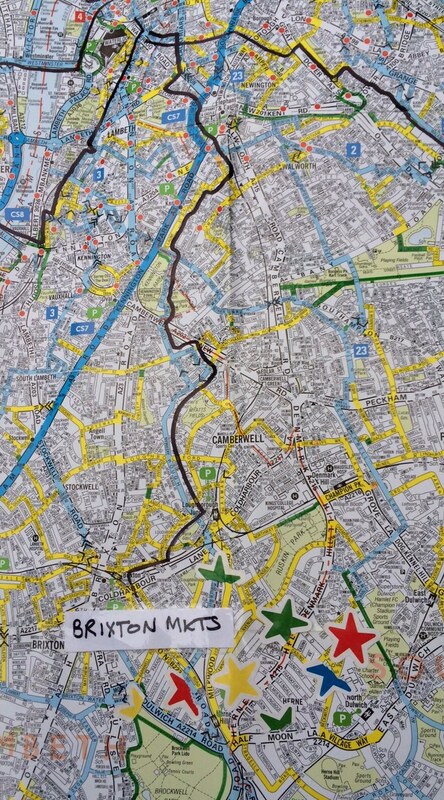 This would link across Streatham Common to either Copley Park or Braxted Park, and north via Hillside Road. The opportunity should be taken to provide an excellent cycle crossing between Valleyfield Road and Leaf Grove. This should comply with the ward proposals signed up to by Councillors of Knight’s Hill ward. The Space for Cycling needed in this area is: Nurture children cycling in the Julian's Primary School area through reducing rat-running and filter out rat-running motor traffic within the area bounded by Knights Hill, Crown Lane/Dale, Streatham High Road and Christchurch Road - in particular St Julian's Farm Road to facilitate pupils at Julian's Primary School sites. '1057 cycle markings' must be positioned in accordance with Bikeability training – that is not in the door zone. We support the junction treatments to bring forward the give way lines, lessen pedestrian crossing distance and improve geometry. While the measures are inoffensive, we question whether the money needed to install raised tables may be better put towards implementing a more ambitious scheme to traffic management and enabling all ages cycling in this area. The consultation closes 23 December. Read more and see plans Lambeth Council's website. Lambeth Council is consulting on allowing two-way cycling on all one-way streets. About 40 streets in Lambeth have already been converted from standard one-way streets to, one-way streets that allow legal two-way cycling. There are still about 70 one-way street in the borough where cyclist cannot legally cycle in both directions. We are working to bring two-way cycling to all one-way streets in Lambeth. Please support the plans but add what additional measures would be beneficial, for example a ban on large lorries using a street as a cut through or better signage. Read more and respond Lambeth's consultation today. It closes on 18 December. Got an idea for a ride? Last month's architecture ride looked at war memorials. Photo thanks to Angela Salt. Have you got an idea for a ride? Want to get involved in planning and leading our rides? We are always on the lookout for new ideas for rides and would welcome your input – we can help you with routes, planning and leading. 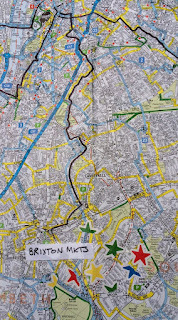 We run regular ‘architecture’ rides – usually monthly – looking at the built environment or interesting features of the London landscape. The rides generally take place on the last weekend of the month starting mid–morning from a Lambeth or nearby location and lasting all day. If you have other ideas, maybe for shorter rides, longer distances or different starting points we are happy to incorporate them into the 2017 ride programme. If you are interested in suggesting rides please contact us for more details. Venture in to Southwark with us on Saturday 19 November for our next Architecture Ride, on the subject of War Memorials. There are over 100,000 war memorials in the UK, about 3,500 of these are in London and over 300 are in Southwark alone. In this remembrance month of November we will explore a very small selection of the lesser known memorials including, of course World Wars I and II but also visit those from other conflicts and which commemorate different groups of victims. We'll start and end our ride south of the river, with a foray into Westminster to sample some more ostentatious sites of remembrance. 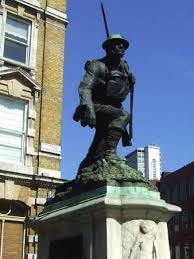 Start is at 10am from the Southwark War Memorial (pictured) on Borough High St, just south of London Bridge. It is next to the Slug and Lettuce pub and almost opposite the historic George Inn. We'll finish in the Waterloo area mid-late afternoon. Meet Lambeth's Cabinet Member for Environment and Sustainability at our next meeting. Join us at our meeting on 15 November when Cllr Jenny Brathwaite, cabinet member for environment and sustainability, will discuss local cycling issues and answer our questions. To help get the best out of the time, you can send questions in advance. We will consolidate questions and send most to Jenny before the meeting. This will help get more answers but it would be great if people with questions can come along to ask them and to discuss answers. Join us on Tuesday 15 November, 7:30pm at Stockwell Community Centre, Studley Road, Stockwell, SW4 6RA. This is just behind Stockwell tube station and there is plenty of cycle parking in the Centre's forecourt. All welcome. Dates for Lambeth Cyclists monthly meetings. Our next architecture ride will be on Saturday 29 October. Our next architecture ride - we may see some tall buildings. We will look at British High Tech architecture in Inner London. The style is sometimes called Structural Expressionism and is found in railway stations, commercial buildings, and housing. We will see the Gherkin, the Lloyd’s Building, and much else, both good and bad! We will consider some of the ideas behind the tradition, and how they work out, or sometimes fail to work out, in the buildings. The ride will be led by Anthony Gilmour. Meet at 10.15 for 10.30am by the railway bridge near the junction of Lambeth Palace Road and Westminster Bridge Road (map). We will stop for lunch at Inn the Park, the café in St James’s Park. The ride will end at about 4.00pm. For some background on the style, see this useful paper High Tech architecture (PDF download) by Colin Davies. 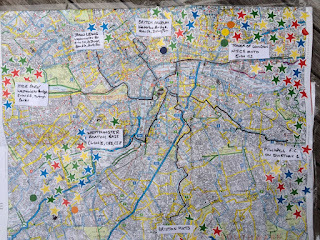 Act this evening or tomorrow to comment on the Loughborough Junction masterplan. The proposals for an increase in permeability for walking and cycling in the masterplan are welcome. Loughborough Junction includes parts of Coldharbour ward, which from census data has one of the lowest levels of car ownership in the UK, and Herne Hill ward which has the highest level of cycle journeys to work in south London. At certain times of the day and night public transport in the area is at capacity. Providing space for cycling is a more efficient use of road space than providing space for driving private motor vehicles, particularly for journeys of 5km or less. 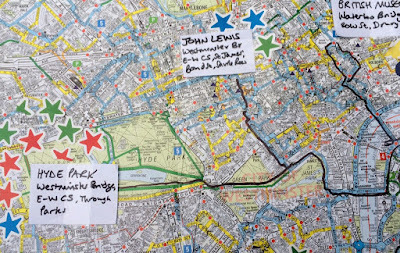 Lambeth Cyclists want the master plan to include proposals for a wider network of high quality direct cycle routes, separate from high volumes and/or speeds of motor vehicle traffic from surrounding areas into and through Loughborough Junction. This is to accommodate the increase in cycle journeys that will be generated by the proposed development. In the short term cycling capacity will provide an opportunity for modal shift from saturated public transport. one where people choose to walk and cycle. Lambeth Cyclists require within curtilage cycle parking for all residents of the new development, and employees in the proposed businesses, and sufficient visitor cycle parking. 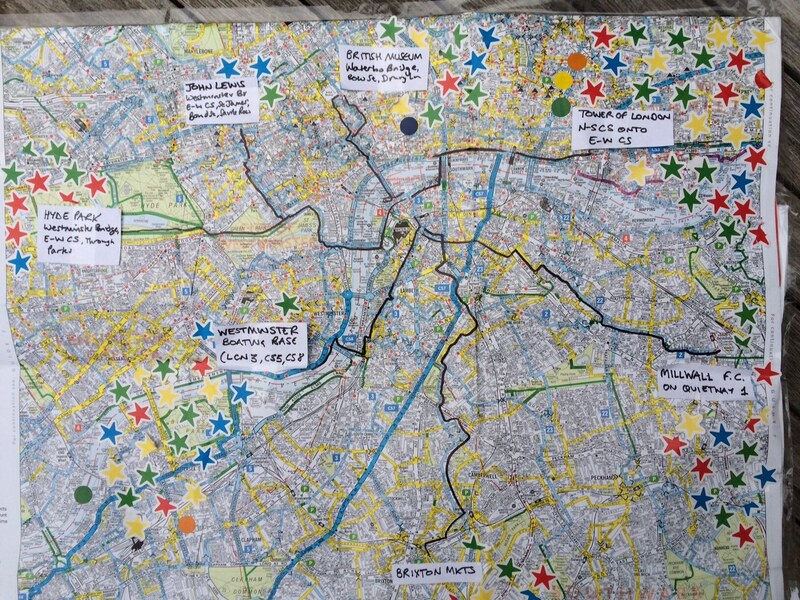 Act now: comment on the Loughborough Junction masterplan. Lambeth Cyclists finally have their monthly architecture rides licked. Our next ride, this Saturday 1 October, will be a truly first class experience as we explore the architecture of Royal Mail and the postal office. We'll be pushing the envelope as we tour Lambeth. We'll meet at 2pm on Garrads Road opposite Prentis Road on the Streatham side of Tooting Commons. It's going to be an express ride around Lambeth finishing in Vauxhall. Lambeth Cyclists is enormously encouraged by results from a survey we did on car-free day. 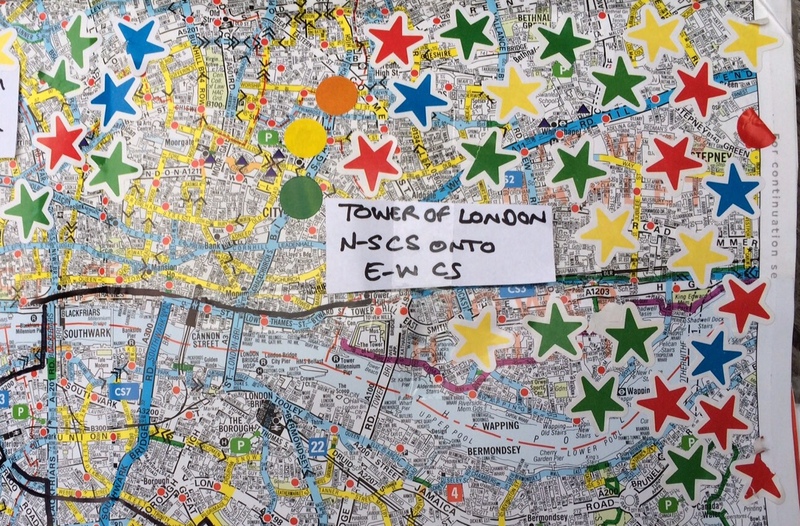 30 out of 34 adults said they would let a pair of eleven year olds cycle, without an adult, to meet relatives or close family friends at the Tower of London, from Cornwall Road in Waterloo. It is clear that there is a willingness by adults to engage with the idea of children travelling independently by bike in inner London. 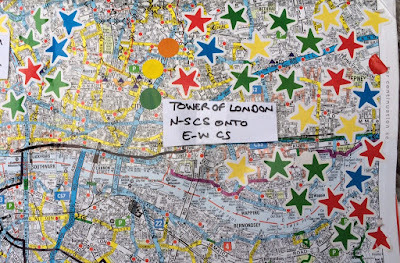 Our survey also showed the importance of space for cycling away from traffic.The Tower of London is reached almost entirely by the segregated north-south and east-west cycle superhighways from Cornwall Road, itself on Quietway 1. The second favourite was Westminster Boating Base in Pimlico, which 24 out of 34 adults said their eleven year olds could cycle to (using London Cycle Network 3 via partially segregated Baylis Road to Hercules Roads and quiet backstreets to Vauxhall Pleasure Gardens, joining segregated Cycle Superhighway 5 across Vauxhall Bridge, then the wide cycle track of Cycle Superhighway 8 along the Thames). As soon as less clear routes with the chance of more traffic came in the numbers fell away sharply. Just 3 out of 34 would definitely let the two eleven year olds cycle to meet family at Brixton markets or John Lewis on Oxford Street (with four putting half stars indicating 'maybe' to Brixton) - the lack of a straightforward route with very low levels of traffic or segregated tracks on main roads was a significant obstacle - even though we told the adults to assume they had cycled the route previously with the children. The lack of segregated space for cycling on Waterloo and Westminster Bridges was an issue for many adults: despite most of the journey to Hyde Park being off road or on segregated tracks across Parliament Square, only 8 adults would definitely let the children cycle the direct route to it and two said 'maybe'. Similarly The British Museum across unsegregated Waterloo Bridge and fairly busy 'back' streets was considered doable by 7, with 4 'maybes'. 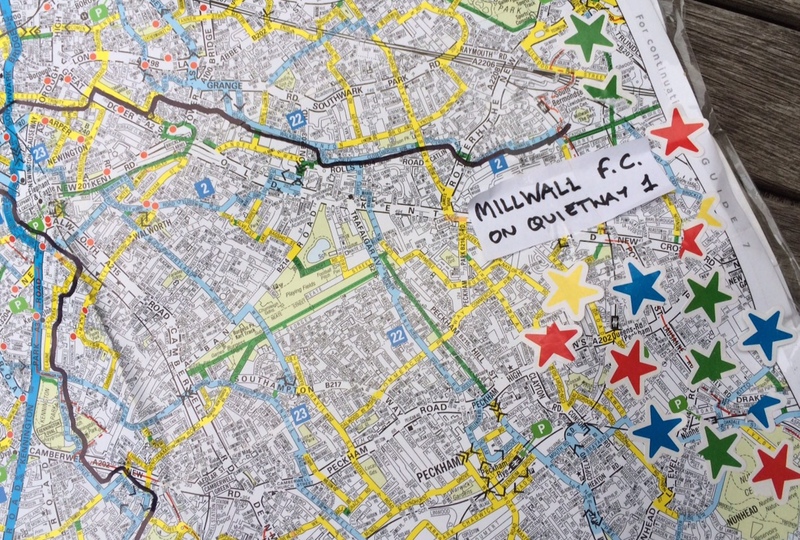 Finally, and firmly in the middle, was Millwall football club, following the sign-posted Quietway 1 on quiet back streets, with 12 definites, and three maybes. Lambeth Council has a cycling strategy, adopted by its cabinet, to make it the most cycle friendly borough. The borough's councillors want Lambeth to take a leap forward, to become a place where cycling is normal for everyone: young, old, women, men, rich and poor. There's still a way to go in the borough. The segregated space on main roads that the east-west and north-south superhighways enjoy shows the most promising way for Lambeth to achieve its ambition. Lambeth Safer Transport Team have just taken possession of 2 speed cameras and say “we have some staff trained, and hoping to arrange further training but are eager to start some speed work to make the road network safer…...I am bidding for training for my Constables to be trained so that we can use the speed guns to do enforcement work and send offenders to court. I have some PCSOs trained so they can come out and do some work but they do not have the power to report offenders but can still warn." Milkwood Road dates are planned for volunteers to do this - dates awaited from John Frankland, chair of local SNT. Cllr. Brathwaite has been invited and Southwark Cyclists are trying to set up a joint meet with Southwark and Lambeth Director of Public Health. Maybe we should invite Scott McDonald - Police Inspector for Lambeth Safer Transport Team Christmas social? Windmill Drive: Consultation report should be out any moment now. What do we do if decision goes the wrong way? Cavendish Rd: Consultation report should be out any moment. What do we do if measures are poor? What can we do better and who can help? Celebrating better use of public space than just for cars, on Saturday 24 September Cornwall Road in Waterloo will be closed and filled with fun and music from noon to 5pm. Lambeth’s sustainable travel team will be on hand to tell you about 'try before you bike' and cycle training. 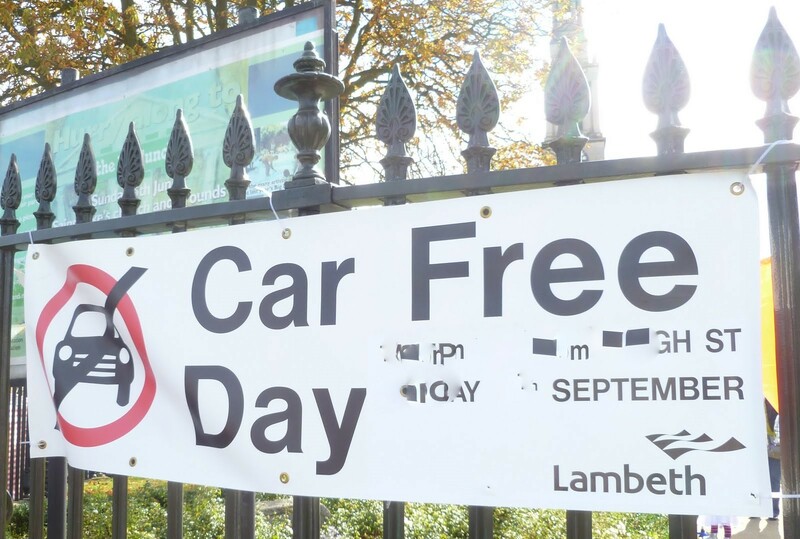 The Lambeth Bike Market (which usually tours schools) is being showcased this year at Car Free Day – so if you have a bike to sell you can bring it on the day, or buy a quality second hand one for you or your child. 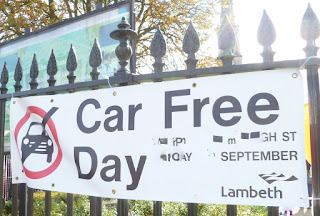 You can find more information on Lambeth council's Car Free Day page. 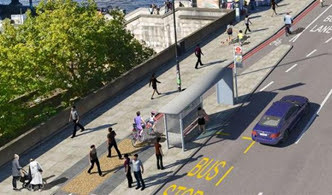 Transport for London is consulting on changes to bus lanes and some junctions on Brixton Hill and on Streatham Hill. Respond by 14 September to give your views on changes that could see bus lanes extended in length, width and time at different places over Brixton Hill and Streatham Hill. Disappointingly, segregated cycle lanes are not part of the plans, despite the space available.There are no reasonable alternative routes between Brixton and Streatham and the road is heavily used by cyclists. 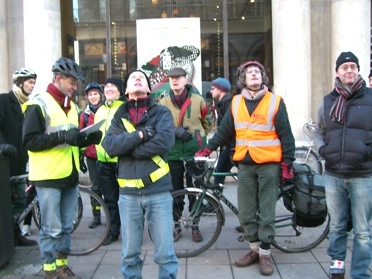 The August meeting of Lambeth Cyclists supported the view of Andrew Gilligan when he was London’s cycling commissioner, that this stretch of road was suitable for and in need of segregated cycling. As an absolute minimum, the road should have wider, continuous and 24-hour bus lanes. 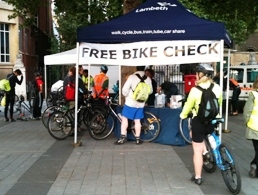 Let us know what you said – post on the Lambeth Cyclists Facebook page or email group. The next Lambeth Cyclists Architecture ride will be on Saturday 27 August. Concrete is one of the most widely-used building materials, but it is often associated with the architecture of the 1960s, and in particular the style known as brutalism, from the French béton brut, raw concrete. Come and join us for a tour of concrete buildings – from the 1960s and before and since - of West and North London, to decide whether you think these concrete icons deserve the term ‘monstrosity’ or ‘marvel’. The ride will start at Hyde Park Barracks at 10.30am. We will stop for lunch somewhere around Camden and aim to finish in central London at around 4pm. Meet at South Carriage Drive opposite the tower of Hyde Park Barracks. As South Carriage Drive is closed westbound at the moment, it will be easier to approach from Exhibition Road and turn right. The ride will be led by Geraldine, Mark and Tessa. If you have any queries contact Tessa on 07949 785258. 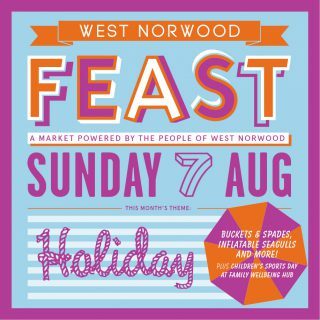 This Sunday, 7 August 2016, Lambeth's Dr Bike team will be on hand at the West Norwood Feast to fix basic problems, adjust your bike and offer advice on further action if required. 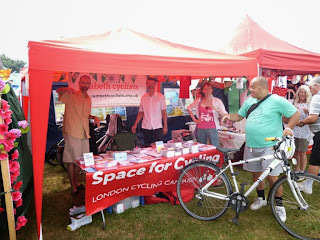 We will also have a stall at the Feast to offer information and promote cycling in Lambeth. Come along and say hello! This year Ride London Freecycle will be once again be running a free led-ride from Clapham Common up to the main Ride London Freecycle event in central London. Everyone is welcome on the free feeder ride which will depart from Windmill Drive Clapham Common at 10:30am on Saturday 30 July 2016 for the trip up to Parliament Square to join the main Freecycle ride through eight miles of traffic free central London. Further details including registration on the Ride London website. Description from Ride London website: Ride London will offer a brilliant opportunity to get the whole family together to experience the fun and freedom of cycling on traffic-free roads in central London. The 2016 event, which is part of a festival of cycling led by the Mayor of London’s office, will showcase new areas of the capital. The route will again take in the Strand and Lincoln’s Inn Fields and returns to the Victoria Embankment, taking in a section of the newly opened East-West Cycle Superhighway (CS3). Vauxhall One will be running a free Dr Bike session today, 21 July 2016, 12-3pm at Vauxhall Pleasure Gardens, Kennington Lane, SE11. Come along to get your bike checked and adjusted and pick up information! Lambeth's Sustainable Transport Team will be running their Dr Bike service this evening, Wednesday 20 July 2016, on Clapham Common Northside (opposite junction with Cedars Road), SW4 0AA. Come along 5:30 -7:30pm to get your bike ready to keep on cycling through the summer. The Dr Bike team can fix basic problems, adjust your bike and offer advice on further action if required. This is also an opportunity to see the view from inside a lorry cab and talk to Lambeth staff about lorry blindspots to avoid any possible problems. The Police will also be on hand to advise on security and register and security mark your bike. 3. Floral Ride review - repeat in 2017? Lambeth Council lead Jamila Barrett. List of potential streets to make two way for cycling presented by Simon Phillips at the last meeting had many omissions. Charlie is awaiting clarification on why and rationale for selection. Charlie asked Richard Lancaster: "Is Lambeth at risk of losing money allocated but not yet spent?". Richard replied, "Presumably you are referring to Quietways. No, not as far as I'm aware, but programmes, roles and responsibilities are still settling down at TfL following the elections." 9. Architecture Rides and other events - Ride London feeder ride 10.30am from and 3pm return to Clapham Common on Sat 30 July: volunteer ride marshals sought. 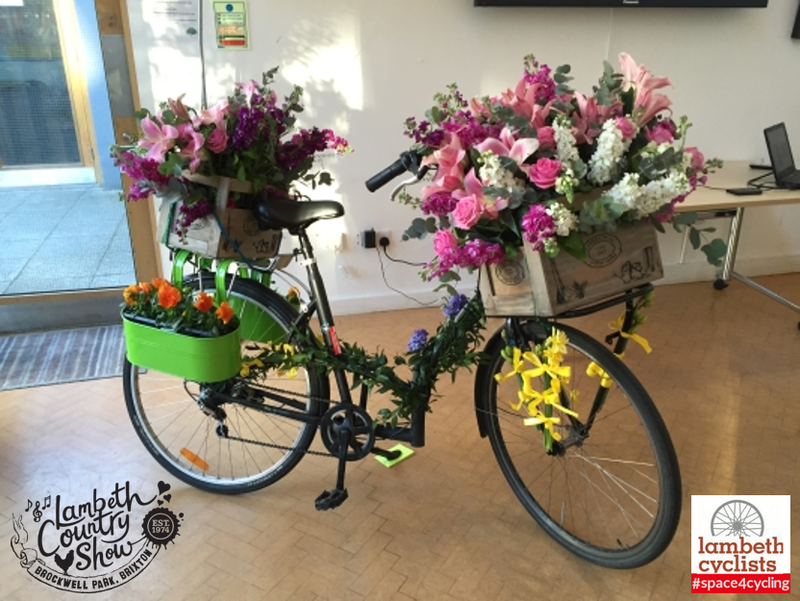 On Sunday 17 July 2016 Lambeth Cyclists is working with Lambeth Council to organise two fun and flowery rides to the Lambeth Country Show from the North and South of the Borough. The floral ride will see cyclists on bikes decorated with flowers ride through the borough in a glorious floral carnival. We have invited local organisations, businesses and schools to decorate their bikes and come on the event. We hope you can join us too - decorate your bike and bring your friends, family and flatmates! The first ride departs at 11:30am from Lower Marsh, near Waterloo Station in SE1 and will travel through Kennington Park Myatt's Fields Park and Loiyghborough Junction to Brockwell Park. The second ride departs at 11:30am from the Rookery Cafe on Streatham Common, SW16 and travels via West Norwood and Rosendale Road to Brockwell Park. 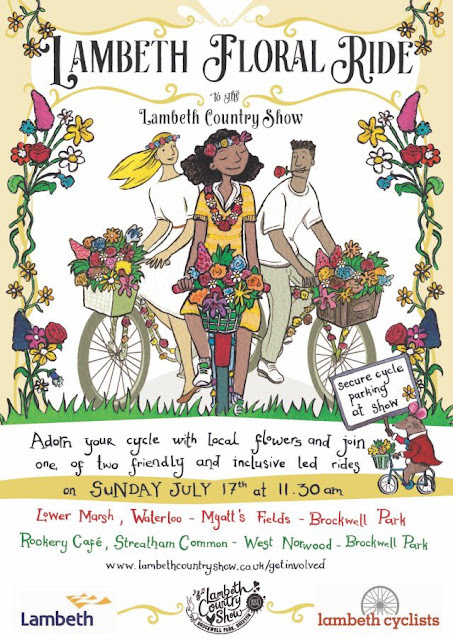 This Weekend, Saturday 16 - Sunday 17 July 2016, the annual Lambeth Country Show takes place in Brockwell Park. 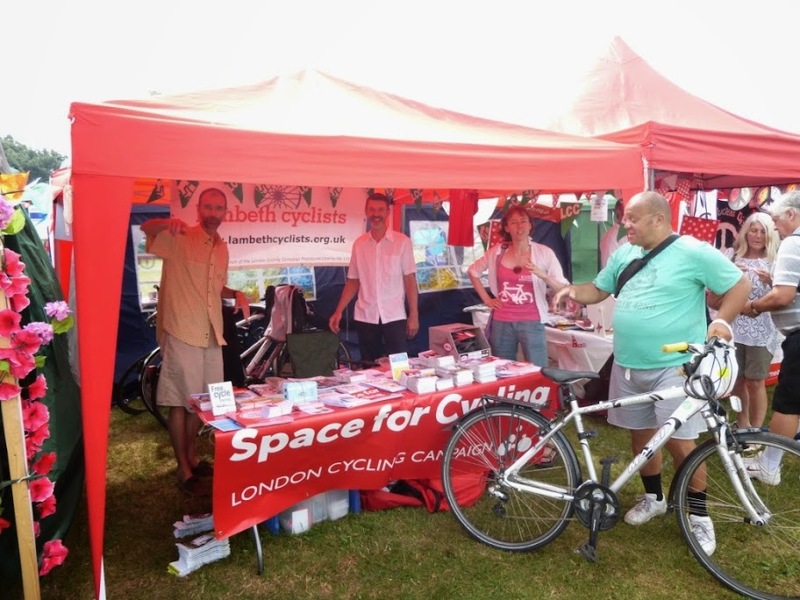 As usual we will have a stall, this year in the newly inaugurated cycling zone, where we will be talking to people about cycling in Lambeth, handing our maps and information and promoting LCC. We're looking for volunteers for the stall - Could you help us out by spending an hour or two on our stall promoting cycling in Lambeth? We need volunteers from 12 - 5 pm on both days (especially on Saturday). Do you live in Larkhall, Stockwell or Vassall Wards in Lambeth? (see Ward maps)? Lambeth are consulting on local priorities for these areas as part of its Cooperative Local Investment Plan which will be used to inform local investment decisions in the area. And are now consulting local people on what they would like to see happen under the different priority headings. To give your views on your priorities please complete the survey on the Lambeth website - the closing date is Friday 8 July 2016. Lambeth's Sustainable Transport Team will be running their Dr Bike service this evening, Wednesday 29 June 2016, opposite Stockwell tube station, SW9. Come along 5 -7:30pm to keep your bike on the road through the summer. Lambeth Cyclists, London Cycling Campaign and Wheels for Wellbeing call on Guy’s and St Thomas’ NHS Foundation Trust to embrace health benefits of cycling, rather than opposing cycling schemes without evidence. Guy’s and St Thomas’ NHS Foundation Trust has announced that its Chairman and Kate Hoey MP have led a protest on Westminster Bridge this morning, Tuesday 28 June 2016, to “mark the start of our legal action to persuade TfL to… rethink its proposals for the provision of cycle lanes and bus stops on Westminster Bridge”. Lambeth Cyclists represents people who cycle in the borough, with over 950 members; London Cycling Campaign, the London-wide parent charity has over 12,000 members and 30,000 supporters; and Wheels for Wellbeing is a London-based charity supporting disabled people of all ages and abilities to enjoy the benefits of cycling. 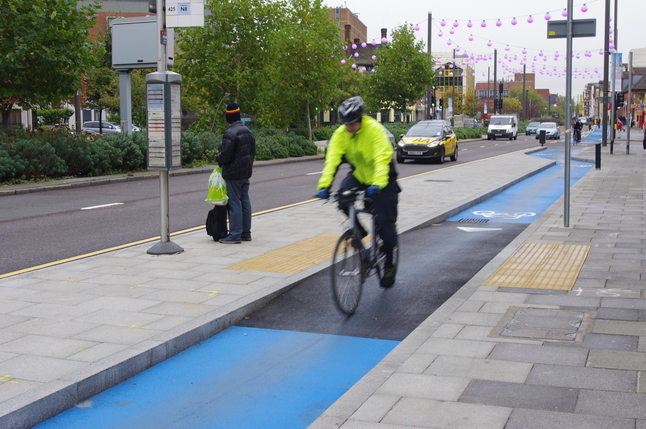 Bus stop bypasses are designed to run a cycle track behind a bus stop, allowing pedestrians to wait for a bus while cyclists do not have to dodge into traffic around parked buses. 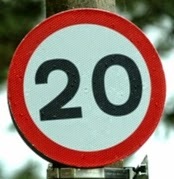 These bypasses are currently relatively rare in the UK. They are, however, widely used on the continent, and have been installed along several London Cycle Superhighways (such as CS2 in Stratford, pictured), with many also in Brighton and other UK cities. The three organisations can find no evidence of UK bus stop bypasses having been a location for a serious collision between a pedestrian and cyclist. 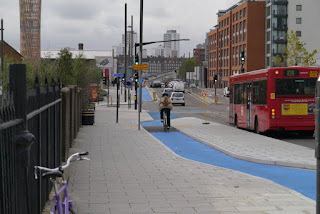 The bus stop bypass directly outside The Royal London Hospital, in Whitechapel on Cycle Superhighway 2, has seen no recorded cycle-pedestrian collisions of any severity, according to TfL. Lambeth Cyclists and Wheels for Wellbeing have already engaged with the Trust, as has TfL, to attempt both to mitigate the Trust’s concerns and to provide alternative ideas that would improve the design for all users. 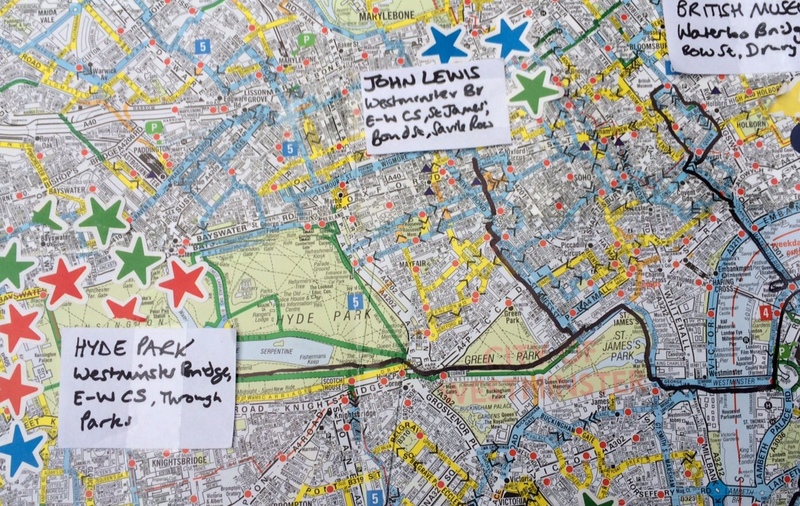 Representatives of the Trust, Lambeth Cyclists and Wheels for Wellbeing met in May and have been communicating since. The Trust has yet to put forward any evidence to back up its concerns and its representatives have said they do not have evidence to back these concerns. The Trust also has no record of any collisions between pedestrians and the many people who already cycle on shared sections of pavement outside the hospital, or those who cycle onwards on the pavement to bypass bus stops informally. The Trust’s concerns are also, inconsistently, solely focussed on one bypass outside the main entrance. They do not apparently object to several bus stop bypasses proposed outside the main entrance of St Thomas’ and on the northern side of the bridge. Thus, the Trust appears concerned about visitors arriving at the hospital from South London, but not visitors leaving the hospital to return to South London (nor visitors arriving from or departing to other areas). TfL already design bus stop bypasses to slow those cycling with markings, signs and where needed raised tables in the track. This approach was proposed as a modification based on Guy’s and St Thomas’ concerns already – with wider-than-standard pedestrian crossing points too. Not only is the Trust raising concerns without evidence to back those concerns, it has failed to take into account adequately the need for serious safety improvements to the bridge for those cycling, or the huge health benefits Londoners gain from schemes that encourage more people to take up cycling. Between 2005 and 2014, from TfL figures, the area around the hospital entrances, including where the bypasses are to be located, saw seven people cycling seriously injured and one killed, and six pedestrians seriously injured and one killed, all from motor vehicle collisions. We believe that if the Trust is successful in mounting a legal challenge to stop the scheme going forward, the likely outcome will be a much-needed safety measure will not be installed and alternative proposals will be unlikely to adequately answer safety issues for pedestrians and those cycling; all to allay fears that have no evidence base. Lambeth Cyclists, London Cycling Campaign and Wheels for Wellbeing are now calling on Guy’s and St Thomas’ Trust to work with us and TfL - to retract its threat of legal action, stop opposing cycling schemes without good evidence to do so, and work with us to improve cycling in the area for their staff, patients and other road users. 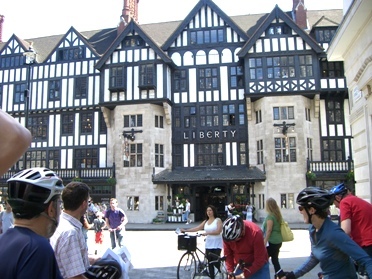 We hope you can join us this Saturday, 25 June 2016, for our latest easy-going ride around the London cityscape. On Saturday we will be looking at the architecture of mental health. How we 'treat' people with mental health problems has varied over the years from medical approaches where patients were locked up away from society to more community-based approaches which have sought to integrate treatment in the community so that people can live as full a life as possible. This cycle-ride will look at some of the significant sites of these different approaches. Our guided tour will start at Kingsley Hall which was designed by Charles Cowles Voysey, son of C F A Voysey. Associated with radical movements, it housed Mahatma Gandhi in 1931. Leaving, we'll ride down Bow Road on the CS2 to Aldgate East, turning off at Leman Street, for lunch in or around St Katherine's Dock. 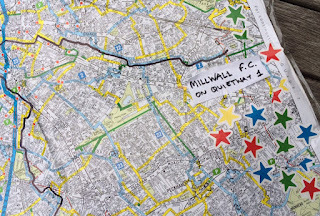 Around 2-2:30 we'll set off, riding across Tower Bridge, in the direction of the Maudsley Hospital in Camberwell and possibly the ORTUS, the Maudsley's learning and events centre in Grove Lane. Meet 10:45 outside Kingsley Hall, Powis Road, Bow, E3 3HJ. (Nearest bike-friendly stations Bromley-by-Bow, Devons Road, and Bow Church: check for closures). This will be an easy going all-day ride with a pub lunch stop. No need to book - just turn up. Please ensure your bike is roadworthy. Contact Geraldine on 07739 232598 for further information. At our annual meeting, held on Tuesday 22 June 2016, we elected a new management committee for Lambeth Cyclists. Richard Laidlaw and Luke Evans, who stood down from the committee at this meeting, were thanked for their contribution. We hope you can join us this in Stockwell Tuesday, 21 June 2016, for our regular monthly meeting. At the meeting we will be hearing from Simon Philips who has recently been appointed as Lambeth's new transport manager. He will be giving an overview of developments in the borough and future initiatives where we can work with the council to further the council's aim of making Lambeth the most cycle-friendly borough. It will also be a chance to ask any cycling related questions you have. This meeting is also our annual meeting at which we will be electing a new management committee to take forward Lambeth Cyclists over the next year. 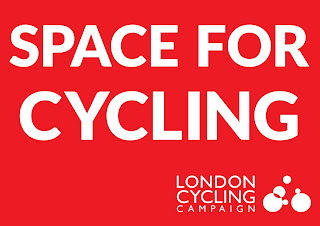 Its your chance to get involved - there are various roles in influencing the council, Transport for London and the public, organising events and rides, communicating with members and working to make our borough more cycle and people friendly. Do get in touch if you would like more information. We will also be looking forward to forthcoming events including the Lambeth Country Show (16-17 July) and the Floral Ride we are running to the show on that Sunday. This Sunday, 19 June 2016, Lambeth Sustainable Transport, Omnibus and Cycle Confident are putting on a magical bike ride to celebrate Midsummer. Cyclists of all ages and abilities are welcome on the ride which departs from Omnibus Clapham (the old library) at 2:30pm. Featuring a trick cyclist, stilt walking & a frantic lover's chase from the cast of Shakespeare’s finest comedy, all in the glorious summer sun. Safely escorted by Cycle Confident marshals, we’ll be starting at the Polygon in Clapham Old Town and making our way round Clapham Common right through to Larkhall Park with many a sight to see along the route! A magical experience for cyclists of all skills and ages that is not to be missed. 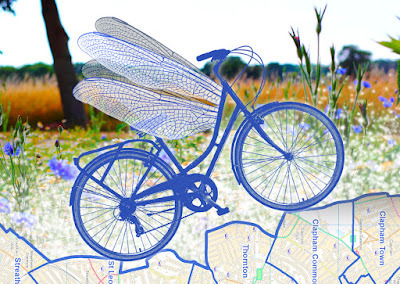 A Midsummer’s Dream Cycle Ride is brought to you by Omnibus, Lambeth Sustainable Transport and Cycle Confident. Adults £3 (plus booking fee) and free admission for children accompanied by an adult. All proceeds from ticket sales will go to Wheels for Wellbeing cycling disability charity. Departs Omnibus, the Polygon, Clapham, SW4 0JG 2:30pm 19 June 2016. The Dr Bike team can fix basic problems, adjust your bike and offer advice on further action if required. The Dr Bike team can fix basic problems, adjust your bike and offer advice on further action if required. The Police will also be attendance security registering and marking bikes. In addition the HGV awareness team will give you the opportunity to sit inside a lorry cab and get advice on how best to position yourself in the road so that you are not in the river's blindspots. 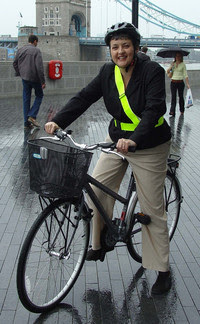 Lambeth Cyclists today welcomed the appointment of Val Shawcross as Deputy Mayor with responsibility for transport by new Mayor of London Sadiq Khan. Val is the former London Assembly Member for Lambeth and Southwark and we worked closely with her over her years as our Assembly Member on cycling and sustainable transport issues. We are pleased that London's transport is in Val's safe hands. In 2015 in recognition of her important work on the London Assembly and especially in promoting cycling on the Assembly Transport Committee Val was awarded an LCC award as Cycling Champion of the year together with London Assembly Member Caroline Pidgeon. We are pleased to see that Caroline has been elected as Chair of the Transport Committe. New Mayor for London Sadiq Khan has announced that he plans to more than double the size of the proposed new Ultra Low Emissions Zone so that it covers the area ringed by the North and South Circular roads. Previously Boris Johnson had proposed that the zone would only cover the Congestion Charge area. With the new boundaries the ULEZ will cover much of Lambeth including Vauxhall, Stockwell and Brixton which have high levels of air pollution. The extension of the ULEZ will also bring benefits to areas of Lambeth such as Streatham, Norwood and Gypsy Hill which are outside the zone. These areas are served by bus routes that travel into the zone and these will run using ULEZ compliant cleaner buses. It is estimated that over half the pollution in densly packed roads such as Streatham High Road and in central Brixton over half of the pollution comes from buses. These measures will come into place, subject to consultation, in 2020. We hope you can join us this Sunday, 22 May 2016, for our latest easy-going ride around the London cityscape. 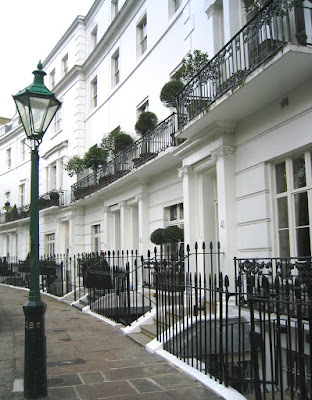 On this ride we will be looking at the 'Premier Streets' of London - some of the the most desirable, opulent and expensive streets in the county. The Monopoly Board for London ranks Mayfair and Park Lane as the highest value streets in London which, to a certain extent, is still true. 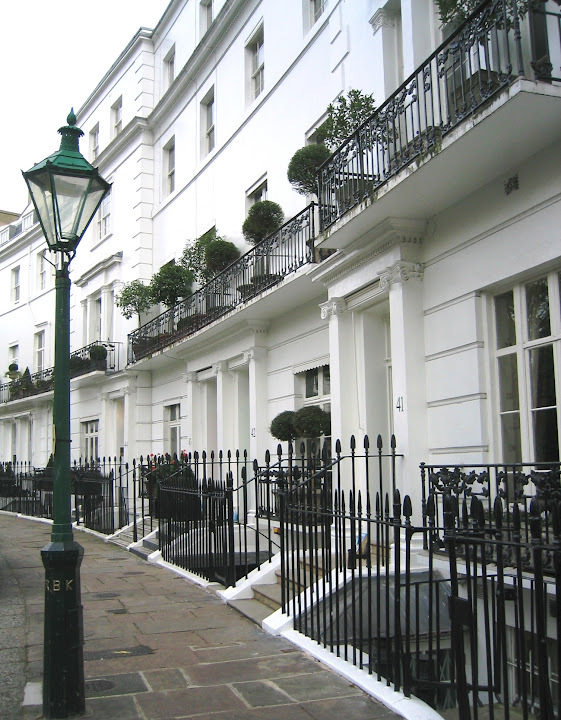 But the desirable parts of town have varied since the Monopoly board was devised with roads in Hampstead, Chelsea and Kensington rivalling the Monopoly favourites in different decades. Wartime damage and the fashion for motorised suburbia drew money away from the centre of town which then came back as traffic congestion made outer London less attractive. In the twenty first century overseas investment has prioritised public transport connections which has led to an explosion of towers near underground and rail stations. This ride, starting at Buckingham Palace, will cover some 20 miles including a few busy streets and a steep hill, ending up in Regent’s Park. We may visit Number One London (Apsley House) cost £6.50 or Leighton House (£10) or Kenwood House (free) if time permits. Ride Sunday 22 May 2016 - Meet 10:20 for 10:30 start at corner of Constitution Hill and Buckingham Palace (opposite Queen Victoria monument). We will have to leave promptly to avoid the Changing of the Guards crowds. End time after 5.00pm at Regent’s Park. Bikes with gears recommended for the hills. We will stop for lunch or bring sandwiches. In particular the Hospital raised concerns about the so called 'floating' bus stops which are an integral part of the design. These allow cyclists to ride in a separate safe lane between the bus stops and the pavement. The hospital said that it feared that patients would be endangered by the stream of bikes and called for a design change after the final design had been passed by TfL following a public consultation. We met with the Trust to listen to their concerns and sought to address them. We highlighted areas where the floating bus stops had been successfully implemented, including outside another hospital, which have not resulted in increased conflict between bus users and cyclists. We also pointed out that hospital patients, hospital staff and cyclists were not mutually exclusive groups and that the hospital states that it wants to encourage cycling for the wider health benefits. Installing a safe cycle route across Westminster Bridge would encourage more people to cycle. Changes to the physical environment could be made near the bus stop to reduce potential conflict between cyclists and bus users. The meeting ended on a positive note with agreement that the hospital would review its position and work with TfL, Lambeth and us to enable a mutually beneficial outcome to be achieved. Lambeth's Sustainable Transport Team will be running their Dr Bike service this evening, Wednesday 18 May 2016, on Clapham Common Northside (opposite junction with Cedars Road), SW4 0AA. Come along 5 -7:30pm to keep your bike on the road through the summer. We hope you can join us this evening, Tuesday 17 May 2016, for our monthly meeting 7:30pm at the Stockwell Community Centre, Studley Road, Stockwell SW4. At the meeting we will be looking at the latest developments in the borough for cycling. As you may have seen on Saturday the latest stage of the Stockwell one-way system transformation opened with new two-way working on the roads - we will be reflecting on this and looking at the next steps. We will also be looking at moves by Guys and St Thomas Hospital to place restrictions on the new design for the cycle path on Westminster Bridge and will be thinking about ways in which we can work with the new Mayor of London and our new Lambeth and Southwark London Assembly Member to make things better for cycling. We will hearing updates on developments (or lack of) on Estreham Road, New Park Road, the cycle superhighways, rides planned, the floral ride and much much else. At this meeting we will also be looking forward to our annual meeting which will take place next month, Tuesday 21 June 2016, where we will be electing a new management committee for Lambeth Cyclists to take the organisation forward over the next year. We are on the look out for Management Committee members. We have lots of stuff we want to do but need people to take it forward! Wanted communications person or people- good with twitter, websites and newsletters? 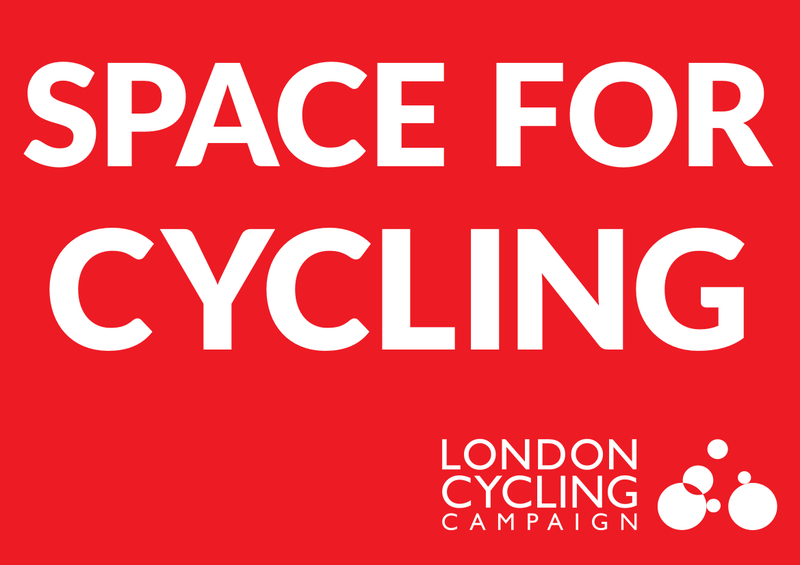 One position in particular we need to fill is that of communications person who is responsible for writing the quarterly newsletter sent out with London Cyclist magazine as well as producing regular email newsletters, maintaining and developing the website and overseeing our social media presence. These tasks are not too onerous but are important as they maintain our public face to the world. If you have experience of these or are interested in communications consider putting yourself forward. The communications role is the one of the posts on the Management Committee, other committee members oversee our work with the politicians and policy makers in Lambeth, our rides, events and our general engagement with local people, the council, the Mayor of London and others who all impact on cycling in Lambeth. The time commitment required for these roles is not great -we tend to have an extra meeting in a pub a week before the main meeting to go over various matters and think things through before the main meeting- but apart from that you can get as involved as much or as little as you want.